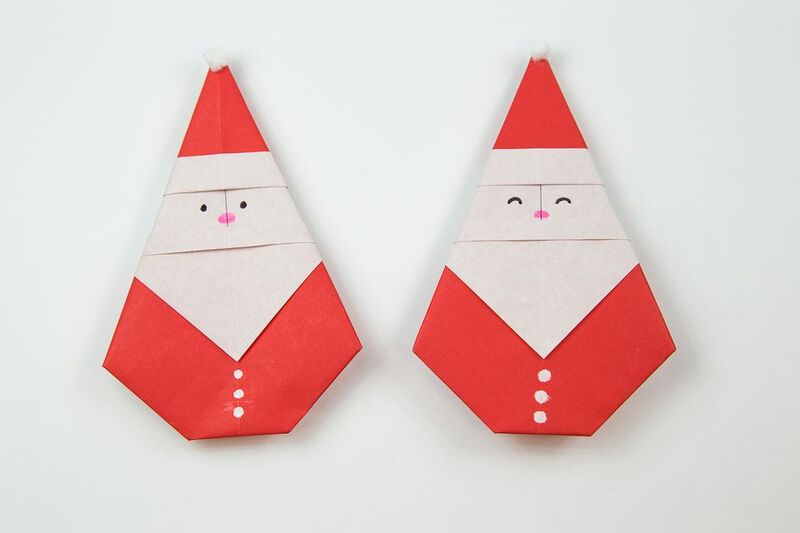 This easy origami Father Christmas is a great DIY project for kids over the winter holidays. You only need one sheet of square paper for this origami Santa. Preferably it will have a red and a white side. If you don't have any of this kind of origami paper, simply just use plain white printer paper and color in the red sections after it's folded. Children may need some help with this origami model at first, but kids aged 8+ should be able to fold it once and get the hang of it. It's recommended to use paper that is at least 20 x 20 cm to start with. Start with your paper with the colored (red) side facing upward. Fold the paper in half, from bottom to top and from left to right. You will now have a neat cross. Flip the paper over to the other side (white side). Fold the bottom edge up to meet the horizontal crease and unfold. Fold the left edge to meet the vertical central crease and unfold. Fold the bottom right corner up to the top left corner, then unfold. Rotate the paper so that the diagonal line is vertically centered and flip the paper over to the other side. Check to make sure that your paper is the same as indicated. Fold the bottom section up as shown and unfold. Fold the bottom corner up to the previous crease and unfold. Fold the bottom corner up to the crease you just made. Fold the bottom corner up again to the crease you just made. Flip the bottom section up. And fold it up once more. Flip the paper over to the other side, and rotate the paper so that the folded corner is now at the top. Bring the top left and right sections in towards the middle. Collapse the top section down and fold well. Fold the bottom corner up to the top corner. Fold the top corner down, leaving a small gap between Santa's hat and his beard. Fold another small section down, creating Santa's mustache. Fold the bottom right corner up to the top corner. Fold the bottom left section up to the top corner. Fold the right edge to the center, folding all of the layers. Fold the left section the same way. Fold the bottom corner up a little bit, completing your origami Santa! You can use some glue to stick the back down, or you can leave it inside a heavy book overnight and it will be flat in the morning. Now it's time to decorate it. You can use a black pen for his eyes, a pink pen for the nose, a white pen for the buttons and a small ball of wool for the top of Santa's hat. As you have an origami Santa, why not fold a simple origami tree? You can create a pretty origami Xmas card by sticking a tree and a Santa onto a piece of card that's folded in half.